We’d love your help. Let us know what’s wrong with this preview of Egg by Kevin Henkes. One is egg blue, one is pink, one is yellow, and one is green. Three of the eggs hatch, revealing three baby birds who fly away. But the green egg does not hatch. Why not? When the three birds return to investigate, they’re in for a big surprise! What will happen next? To ask other readers questions about Egg, please sign up. 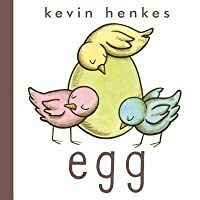 Egg by Kevin Henkes is an adorable book for preschool age children about four hatching eggs. It reads like a graphic novel without much in the way of sentences. It's basically a lot of single words and children love the illustrations! The story is so cute and the ending is perfect. There's not even any real sentences in this book, it is for babies. The basic plot is that there are four eggs of different colors. Three of them hatch, but the green egg remains unchanged. The birds peck open the egg (which I think is a bad idea - what if the animal inside wasn't ready to come out?) to reveal it is an alligator egg. They fly away, afraid of the alligator, but the baby alligator is alone, sad, lonely, miserable, so the bird's come back and be its friends. They ride on the alligato There's not even any real sentences in this book, it is for babies. The birds peck open the egg (which I think is a bad idea - what if the animal inside wasn't ready to come out?) to reveal it is an alligator egg. They fly away, afraid of the alligator, but the baby alligator is alone, sad, lonely, miserable, so the bird's come back and be its friends. They ride on the alligator's back, it swims into the sunset and they see the orange sun glowing in the sky. Is it an egg? Maybe. Kevin Henkes is pretty famous. You might have read some of his other books, like Olive's Ocean or Lilly's Purple Plastic Purse. Very nice book that looks at eggs...and teaches you not to count them before they hatch! Kevin is brilliant. This book is gorgeous. A book of few words about eggs, and the wonders, and, occasionally, the surprises they contain. Gorgeous, masterful and absolutely perfect for the toddler-preschool set - and old librarians too. I was bewitched by this one. Maybe a primer for learning about adoption. Maybe a companion to The Carrot Seed, and/or to other stories of unlikely friendships. Maybe a way to tell if your preschooler is ready for leveled readers. Maybe just brilliant. Btw, to the reviewer concerned about the hatched birds trying to peck open the slow egg, yes, you're right, it's a bad idea, but look: they failed. Henkes' drawings are simple and effective (like Elephant &am Maybe a primer for learning about adoption. Maybe a companion to The Carrot Seed, and/or to other stories of unlikely friendships. Maybe a way to tell if your preschooler is ready for leveled readers. Maybe just brilliant. Another winner by the stellar Kevin Henkes. The story is adorable and the artwork is magnificent, happy and warm. Typical Henkes. Henkes describes Egg as a graphic novel. It is aimed at the youngest readers who will be enchanted by it. 5 bright and shiny stars! Pretty damn delightful. It really IS a graphic novel for preschoolers. I think this could really go far in a little kids story time. A sort-of companion to Waiting and A Parade of Elephants, Egg presents four eggs—a pink, a yellow, a blue, and a green one—and invites us to watch what happens. Three hatch and the colored chicks inside fly away, but not a crack appears on the green egg. How long do we have to wait to discover what it contains? The pink, yellow, and blue birds return and examine the egg. They want it open now; who wants to wait for a late bloomer to take his or her time meeting the world? The shell cracks, the t A sort-of companion to Waiting and A Parade of Elephants, Egg presents four eggs—a pink, a yellow, a blue, and a green one—and invites us to watch what happens. Three hatch and the colored chicks inside fly away, but not a crack appears on the green egg. How long do we have to wait to discover what it contains? The pink, yellow, and blue birds return and examine the egg. They want it open now; who wants to wait for a late bloomer to take his or her time meeting the world? The shell cracks, the top pops off, and the birds are stunned by what emerges. No bird they've seen looks like this one! The three birds fly off to avoid danger, leaving the hatchling with no one, but maybe they were too hasty assuming the creature won't be good-natured. When you force a late bloomer out early, you shouldn't be surprised if it looks and acts different from others. Perhaps the chicks and the animal from the green egg can be friends in spite of their dissimilar appearances, earning a happy ending...until the next time an egg hatches somewhere to an audience who can't wait to find out what's inside. This will go down as the first picture book C could "read" from beginning to end." Just looking at the cover you get Kevin Henkes' wonderful sense of caring and compassion. The book opens with 4 eggs, waiting to hatch. Three do with sweet chicks out and about almost immediately say good-bye but wait, one egg remains. The chicks come back, find a surprise and new friends are made. Simple, soft pastel colors, pinks, yellows, blues, greens, simple language repeated 3 or 4 times a page, all add to the success of the story and the joy of the read. I love the page that describes wai Just looking at the cover you get Kevin Henkes' wonderful sense of caring and compassion. The book opens with 4 eggs, waiting to hatch. Three do with sweet chicks out and about almost immediately say good-bye but wait, one egg remains. The chicks come back, find a surprise and new friends are made. Simple, soft pastel colors, pinks, yellows, blues, greens, simple language repeated 3 or 4 times a page, all add to the success of the story and the joy of the read. I love the page that describes waiting with 16 images with that one word and the egg......perfect. 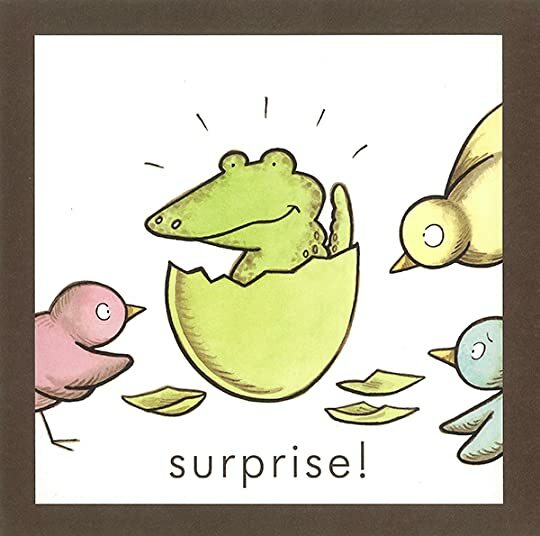 Cute book about eggs and the surprise when they hatch! Fun pastel colors, done in watercolors with brown ink. Three baby birds are born, but they'll be surprised by what hatches Good for early readers, only 4-10 total different words throughout the book with repetition. It never fails to amaze me how clueless adults reading picture books can be. The reviews here amaze me. No, this is NOT a graphic novel for preschoolers, even though it's described as such. No, this is NOT a "book for babies," as some have said here. What this is instead is a great example of the genius that is Kevin Henkes. What looks simple is not. This is a picture book for kids old enough to talk about the pictures in a thoughtful way. You can't really read this to a baby or toddler, there's no It never fails to amaze me how clueless adults reading picture books can be. The reviews here amaze me. This is a picture book for kids old enough to talk about the pictures in a thoughtful way. You can't really read this to a baby or toddler, there's not enough text, and the graphic novel STYLE way this is laid out doesn't make it good for their focus. And it won't make a good group read aloud either. But this will be excellent for kids on the brink of reading, because there are minimal words, and words are repeated, so once they know a word or two they can "read" a lot of the book. And there are places for story telling and language development. Kevin Henkes is a treasure. His books are so gentle and sweet, without being cloying. This one is utterly charming, with a fun surprise. There are few words, and clear pictures, so that a child can "tell" you the story without needing to be able to read. The paintings/illustrations are exquisite; Henkes uses lovely spring colors and watercolor paint with a delightful woody, as in trees, brown ink trim. I like especially the notion of referencing gestation periods, ie a bird is 12-14 days, and alligator (you can tell by the curved snout, unlike the pointy one of a crocodile) hatches in 65 days. I like this because as a child, around 8, I was very curious about when babies, cats, and the birds in nests in our trees would be born. This book is remarkable especially since it gets so much information out there in a "musical" way. The pecking and baby birds flying seem to jump off the page as sounds to me, for example I hear the flapping of wings and chirping. No complete sentences, so not an easy reader, just a delightful book to make sounds with and look at pictures with a child maybe even up to 8 because of the science. I find the pecking enthusiasm of the birds a bit aggressive, but perhaps they are just so looking forward to the next baby's birth, whatever it is, their curiosity has no bounds. Sweet and surprising. I love how it trickles into the surreal at the end. Henkes still gots it! I love Kevin Henkes, and this book reminds me why. Just like in A Good Day, Henkes tells an interesting, suspenseful story with very few words and strong young-child appeal. Henkes returns with another winner of a picture book. This time he uses a graphic novel format ideal for preschool picture book fans. The book is utter simplicity, using repetition to show each of the four eggs: one pink, one yellow, one blue and one green. At first they are whole, then three begin to crack. Soon three chicks have emerged! Still, the green egg stays whole and quiet. There is lots of waiting and the three chicks return to help the final egg start cracking open. Then they are the Henkes returns with another winner of a picture book. This time he uses a graphic novel format ideal for preschool picture book fans. The book is utter simplicity, using repetition to show each of the four eggs: one pink, one yellow, one blue and one green. At first they are whole, then three begin to crack. Soon three chicks have emerged! Still, the green egg stays whole and quiet. There is lots of waiting and the three chicks return to help the final egg start cracking open. Then they are the ones who get a surprise when the egg hatches! Simple and completely wonderful, this picture book graphic novel is great fun to read. Children can help by repeating the phrases the right number of times along with the adult reader. There is a lovely rhythm created by the repetition, almost swinging along with the beat. The limited vocabulary is also welcome for new readers. The art by Henkes stays simple as well. With firm lines and soft pastel colors, the book is ideal for springtime (or those of us dreaming of spring). Even the illustrations get in on the repetition, using similar panels to repeat as the different eggs wait, hatch and then wait once more. When wandering in the wild whenever you find a nest filled with eggs or an egg with no nest or parents in the area, unless you have prior knowledge of its coloring, you have no idea what this egg represents. There is a tiny life inside; growing and waiting to burst forth into the world. It's the not-knowing which gives an egg its magic. It offers us the opportunity to wonder and discover. Unless eggs happen to be on an animal's diet, if found they might approach them with the same curiosity as w When wandering in the wild whenever you find a nest filled with eggs or an egg with no nest or parents in the area, unless you have prior knowledge of its coloring, you have no idea what this egg represents. There is a tiny life inside; growing and waiting to burst forth into the world. It's the not-knowing which gives an egg its magic. It offers us the opportunity to wonder and discover. Unless eggs happen to be on an animal's diet, if found they might approach them with the same curiosity as we humans do. What is this? Does it belong to someone? What's inside? Beloved and esteemed author illustrator Kevin Henkes released his fiftieth title on January 3, 2017. Egg (Greenwillow Books) is full of all those little moments which make life as wonderful as it can be. I. Love. Kevin. Henkes. This book is adorable- all of his books are- and it's aggressively clever. It would be a very fun read-aloud for preschoolers and toddlers and it would be a great book for a very early reader. It has a lot of simple sight words ("egg," "peck," "sad") and the text is large and the kerning is wide, making it easy for kids/adults to point out individual letters. 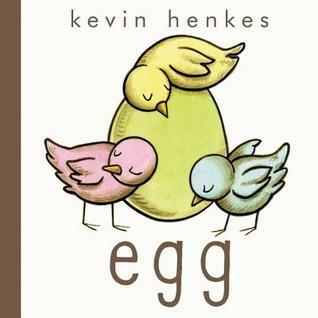 Henkes is always great but "Egg" has even more potential to be a great storytime read. Edit: I’ve read this in stor I. Love. Kevin. Henkes. This book is adorable- all of his books are- and it's aggressively clever. It would be a very fun read-aloud for preschoolers and toddlers and it would be a great book for a very early reader. It has a lot of simple sight words ("egg," "peck," "sad") and the text is large and the kerning is wide, making it easy for kids/adults to point out individual letters. Henkes is always great but "Egg" has even more potential to be a great storytime read. My three year old son absolutely loves this book. I read it to him once over and then he proceeded to "read" it to me. The repetitiveness of this story gave him the confidence to know what was coming next and recognize similar words. He loves the "surprise" and we have read this book for bedtime two nights in a row so far. Highly recommend for small children and also children starting to learn their letters and possibly sight words. Fun and expressive illustrations; great vocabulary. Think spring, and every warm day isn't that what many of us are thinking? 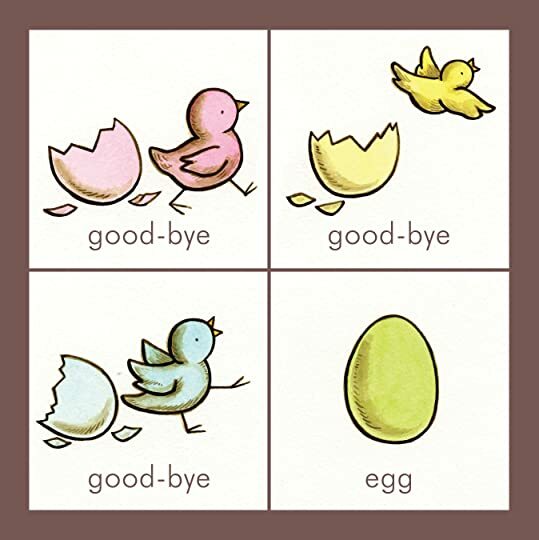 Kevin Henkes takes four pastel eggs, shakes them up a little with a few words, like "peck" and "crack", and then there are three delightful little chicks, but that fourth one, "oh-oh"! Young and old will want to turn the pages quickly to discover just what will happen next! Just received an advance copy and have fallen in love. I won't spoil the story but I will say this is an exquisite picture book and is also perfect for beginning readers to help tell since there is lots of word repetition. I love this book!!! Such a super cute story and your child will love it too. Cute almost wordless book about being friends with those different from you.